This material was developed by Plainsman Clays as a substitute for Gerstley Borate. Boraq 1 was later adjusted to become Boraq 2 (recipe also available). The materials in the recipe are difficult to get in most places. Actually, Cadycal and F-4 Feldspar are no longer manufactured. However we make this and other recipes public as examples of how material substitutes can be formulated to emulate the physics and chemistry of others. For more information about the logic behind this recipe and why it was adjusted to Boraq II please visit the Boraq material page at digitalfire.com. 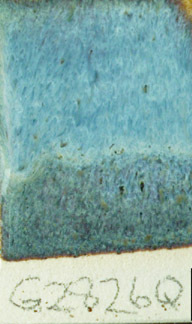 The rutile blue variegation effect is fragile. It needs the right melt fluidity, the right chemistry and the right cooling (during firing). 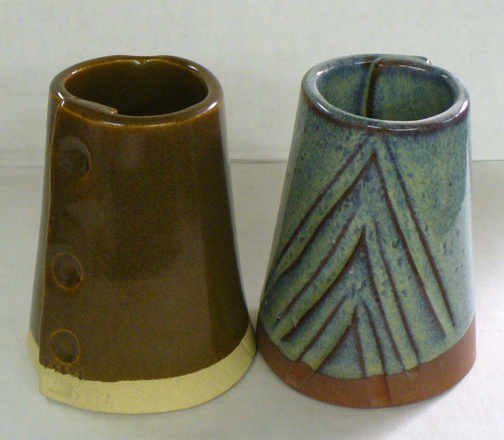 This is Alberta Slip GA6C recipe on the right (normal), the glaze melt flows well due to a 20% addition of Ferro Frit 3134 (a very low melting glass). On the left Boraq has been used as the flux (it is a calcium borate and also melts low, but not as low as the frit). It also contains significant MgO. These two factors have destroyed the rutile blue effect!